Photos of a rare Amur tiger, caught on film for the first time in Wangqing Nature Reserve in northeast China’s Changbai mountains, are giving hope to tiger recovery efforts in the region. 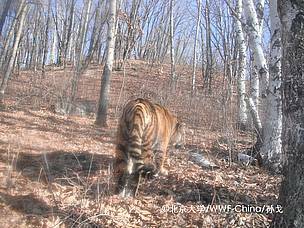 Changchun, Northeast China – Photos of a rare Amur tiger, caught on film for the first time in Wangqing Nature Reserve in northeast China’s Changbai mountains, are giving hope to tiger recovery efforts in the region. A camera trap set up in the reserve captured two photos of the tiger in April. These photos provide evidence of the extension of the Amur tiger’s range from Hunchun, located close to the Russian border, into the inner Changbai mountain area, part of the Amur-Heilong Tiger Landscape that straddles China and Russia. Amur tigers migrating to the inner Changbaishan area must pass through Wangqing, located next to the Hunchun Nature Reserve. 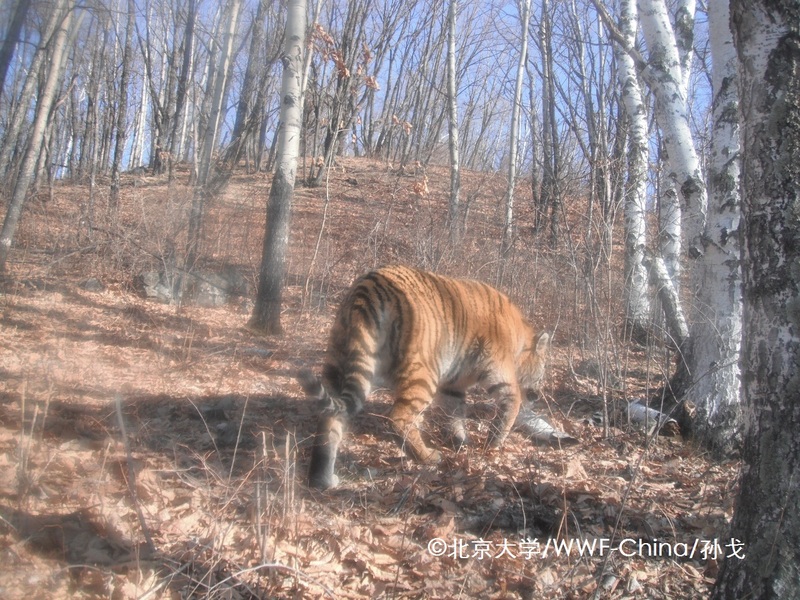 As recommended by WWF-China, the Jilin Forestry Department has accorded Hunchun-Wangqing the highest priority protection area in The Project Plan of the Recovery of Amur Tiger and Tiger Habitat in Changbaishan Area in Jilin. 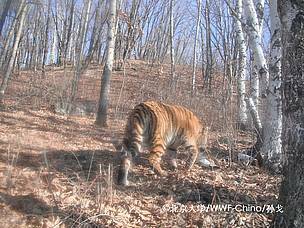 Although footprints of the Amur tiger have been discovered many times in Wangqing since 2008, this is the first time that a camera trap set up in the reserve has captured photos of the rare species. Experts will try to identify the individual tiger photographed by comparing it with photos of Amur tigers taken previously in Hunchun. At present, the Jilin and Heilongjiang forestry departments, International Feline Research Centre of China’s State Forestry Administration and WWF are working together to set up automatic infrared cameras to build the monitoring platform to cover core potential Amur tiger habitats in the Changbai and Wanda mountains in Jilin and Heilongjiang Provinces respectively. Amur tigers were once widespread in northeast China. Habitat degradation and fragmentation, poaching and a small prey base have led the wild population to decline. Estimates put the current wild Amur tiger population in Northeast China, mostly confined to the Changbai Mountains in Jilin Province and Wanda mountains in Heilongjian Province, at between 18-24 individuals. The adjacent forested habitat of the Russian Far East holds more, between 430-500 tigers. WWF-China and its partners are carrying out a number of conservation measures to save the Amur tiger. These include helping ungulate populations such as wild boar and roe deer – the tiger’s main prey – to recover; stopping poaching by helping local authorities carry out anti-poaching activities; and increasing and connecting protected tiger habitats so tigers can safely move from one area to another.